Responsive design and images optimised for modern retina displays on iPhones and iPads are a great way to future-proof your website. Most WordPress theme developers have spotted the craze for responsive design, and more and more themes are now mobile-responsive. There are far fewer WordPress retina themes that are also responsive. I’ve written this post to help you find great themes that offer both. It wouldn’t be right to write about the top responsive retina WordPress themes without mentioning Avada, since this is the current best selling WordPress theme. Avada is fully mobile-responsive, retina ready and has a huge number of shortcodes that allow you to create unlimited layouts. There are also loads of impressive-looking image sliders and theme options allowing you to change the colours, fonts etc. 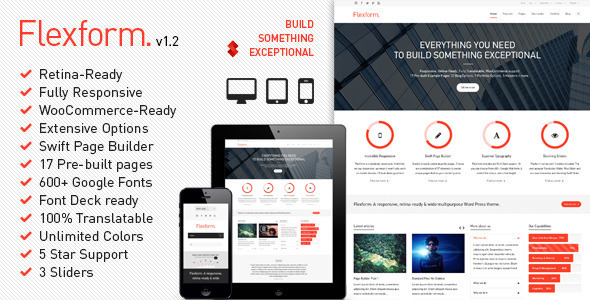 Avada is unusually flexible and lets you tailor the theme to suit your business. Oh, and it looks good too! 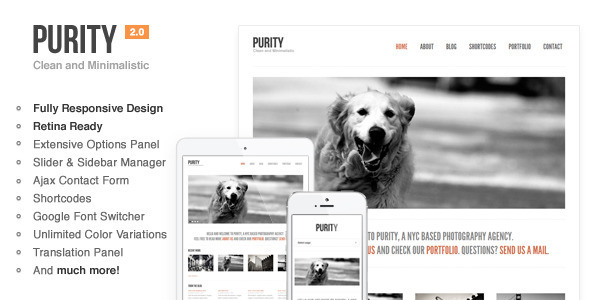 Purity is a nice clean design as well as being mobile-responsive and retina ready. It’s suitable for business or porfolio websites and will present your business in a professional and modern way. While not as flexible as Avada, it does what it says on the tin and is simple and easy to set up. 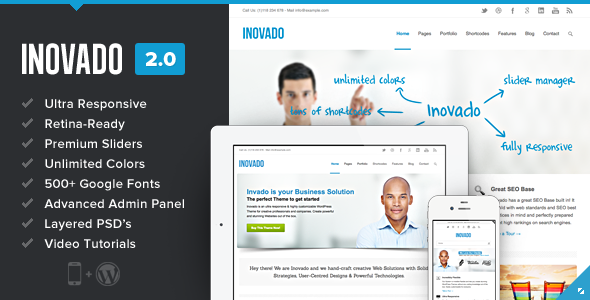 Invodo is a very modern and minimalist design that will adapt naturally to your business and brand identity. Like Avada, it includes the revolution slider that is so popular at the moment. There are plenty of options allowing to configure the design and fonts to suit your business. There’s also a good choice of page layouts, so it’s easy to make your content look professional. Nimble is a bold design with plenty of colour, and you can customise the colour to match your brand identity and logo. It has built-in support and styling for WooCommerce, so it’s easy to transform your website into an online shop that looks fantastic straight out of the box – no extra styling needed! The unique layout builder allows you to create custom layouts for your web pages. Black Label is an extremely striking responsive WordPress theme that is retina ready and designed to showcase images in a striking and impressive way. The full-screen images and videos are placed firmly at the forefront of this theme, making it ideal for websites heavily dependent on visuals such as photographers and creative agencies. 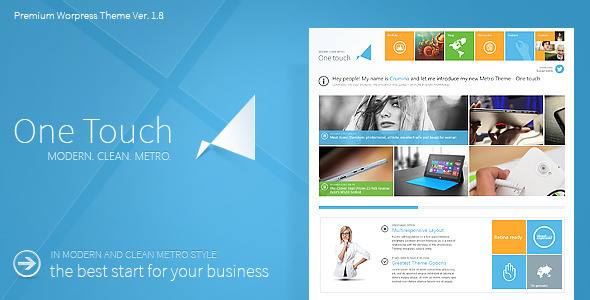 One Touch is based on the Metro style so popular this year. You can customise the layout of your website using the theme’s shortcodes and templates. I would recommend this theme for modern and dynamic businesses that want to present themselves as cutting edge and ahead of the competition. Flexform has a nice bold design that really stands out, while being modern and minialist at the same time. It has a huge number of shortcodes for formatting your content, including some you wouldn’t expect such as charts. The custom page builder allows you to create custom layouts, too. Flexform is black and white with a single accent colour. You can easily change the accent colour to match your own branding. In many ways Cleanspace is similar to Flexform, but I have provided it as a point of comparison as they’re both very impressive. 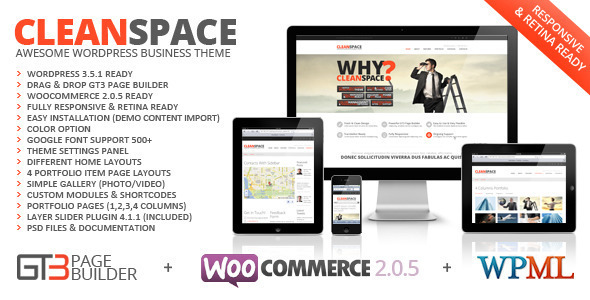 It is fully mobile-responsive, retina ready and pre-integrated with popular plugins such as WooCommerce and WPML as an added bonus. The page builder is useful for creating custom layouts to suit your content and there are plety of theme options for customising the colours, fonts and much more. Why choose a mobile responsive WordPress theme? It’s a good question. People love to throw phrases like ‘responsive design’ around to sound trendy, and it’s worth thinking about why you want a responsive WordPress theme. In the past, websites were fixed width. This meant that when viewed on a screen that was narrower than the website, the content would no longer fit on the page. Typically, horizontal scrollbars would appear allowing you to access the rest of the page. Responsive design has changed all this. It allows websites to automatically adjust their layout, scaling up and down to fit the device they are viewed on. This is the ideal way to make a website mobile-friendly and means you don’t need a separate mobile site. A responsive WordPress theme will make your website look fantastic on all devices, ranging from full sizes monitors to the smartphones and tablets. What is a retina WordPress theme? More and more devices, including the latest iPhones and iPads, have retina displays. These are basically high definition (HD) screens that make images look sharp and crisp. You probably know that high definition TV’s only display in HD if the programme you’re viewing was filmed in HD. 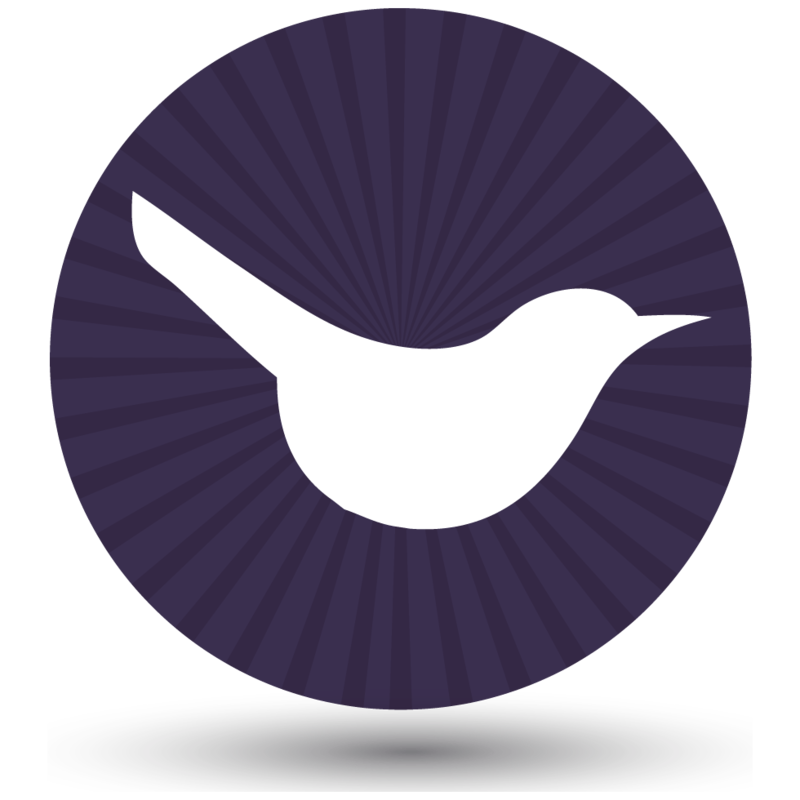 Similarly, images only look their best on retina displays if they are retina compatible. Without this, the images on your website will look fine viewed on a retina display, but they won’t be shown to their full potential. Retina ready WordPress themes will allow you to upload alternative, high definition versions of all the images on your website so that they look absolutely fantastic on devices with retina displays. This will make your business look really professional and impress your customers – which, after all, is what choosing a WordPress theme is all about!